Not thirty minutes from our house by bike is a wild place where camels roam and nomadic Kazakhs squirt mares’ milk into plastic buckets. The thorn-strewn foothills of the mighty Tianshan Mountain range play havoc with our bicycle tyres, but the barren desolation of the Urumqi reservoir cannot be beaten for a day away from the mobile-phone-antennaed, high-rise noise pollution of downtown Urumqi city life. Perched at the margins of the city but also of time itself, the Kazakh village encampment straddles medieval and 21st century worlds with ease. Whilst the village itself acts as a base to rear camels all year round, some of the men and a few women and children make the annual spring pilgrimage with their sheep and goats to the high pastures in spring, returning only when snow threatens in October. Four-by-fours and motorbikes are the vehicles of choice these days for Kazakh nomads for whom trudging up and down mountains and lugging their yurts by camel up to the summer meadows are largely a thing of the past. Each spring the migration to the hills still goes on, but instead of strapping everything to the backs of a string of camels, most of their belongings are piled into a truck that takes them most of the way to the grazing land above the smog and the heat of the plains. But horses are still de rigueur for young guys who vie with each other for speed and daring as they race among the crags. Kazakhs have roamed Xinjiang, the Uyghur autonomous region of Northwest China for many hundred, and probably even thousands of years. Whilst the Uyghur Muslim people are essentially settled farmers, the Kazakhs are herders who have criss-crossed the high passes of Turkestan since time immemorial when borders were fluid and tribal rulers and Khans called the tunes. Uyghurs have settled the oases surrounding the massive Taklamakan desert into which Great Britain in its entirety would fit snugly, and long for a homeland of their own. Since Stalin divided up the area on the other side of the border known as West Turkestan into five ‘Stans’ and the collapse of Communism in the early nineties propelled each Muslim region into sovereign statehood, Kazakhs on the Chinese side of the border have always known that unlike their cousins the Uyghurs, if the worst came to the worst they had a homeland they could escape to. And for some the worst is coming to the worst. The Chinese government’s 2012 five-year plan to re-settle the majority of its nomadic peoples by the year 2017 has seen Kazakh land being sold off and grazing pastures diminish rapidly. There are rumours too that a plan to re-release wolves into the high pastures is a plot to scare the Kazakhs and their flocks and precipitate a twenty-first century future for them in the ‘safety’ of the cities where their children are already being educated. A distraught friend returned from tending his sheep in their summer encampment the other day to say that wolves had made off with a couple of his lambs during the night. Setting off firecrackers no longer seemed to deter the hungry animals, and he was not sure how long they could continue safely taking their flocks to the high pastures in summer. With reduced grazing possibilities what future did they have? Beijing’s argument that the mountains have been over-grazed doesn’t wash with many Kazakhs who feel this is simply a ploy to grab their land and use it to settle Han Chinese swarming into the province in their tens of thousands and dilute the Muslim presence. Others feel it is time to cut their losses and go to a land they hope will welcome them on the other side of the mountains. But for the time being the village behind the reservoir is still filled with Kazakh families who have yet to make the break. Sales of horse and camels’ milk, dried cheese and every now and again a kilo or a side of camel meat are the modestly flourishing cottage industries here on the outskirts of Urumqi and so far refreshingly free of the paraphernalia that tends to accompany other places tourists might like to go around the province. This is Kazakh life in the raw. Not a plastic tree, concrete tree stump or coke stand anywhere in sight. No entrance fees, tickets or special car parks for visitors. It is a wonderful place to come and watch another world go by. 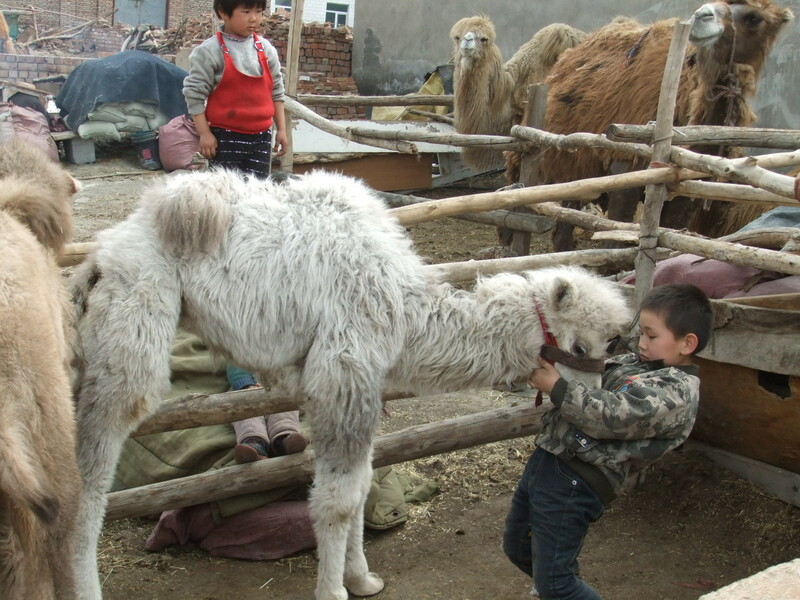 Each smallholding has five or six adult camels and a bevy of calves in springtime. Calves are allowed to suckle for a couple of minutes before the life-giving elixir is squirted into a grubby bucket then poured through an equally grubby piece of gauze into another waiting container ready for the customers who trickle into the encampment with bottles and jars to collect the ‘medical milk’ as it is known here and return to elderly relatives or sickly children in the city. Mother camels wail when they are separated from their calves and make a pitiful spectacle until they are reunited with their offspring. The proud beasts thickly coated in winter begin to look decidedly bedraggled in early summer as their hair falls off them unevenly in huge clumps to prepare for the raging heat of summer. They then wander around, looking neatly shaved shadows of their former selves, until autumn arrives. It’s become quite the thing these days to trail up in posh cars with your children and ailing aunts and uncles and to drink fresh, still-frothy camel milk. The juxtaposition of ancient and modern is striking as the intrepid townies wind their way up the bumpy track through Number One Power Station, under myriad buzzing power cables and pylons and past the cooling towers to finally reach the foothills. Those who arrive in the early afternoon are met head-on by herds of loping animals pouring down the lane towards them. As the camels return from grazing around the foothills, they make a beeline for their own paddocks where calves wait plaintively to suckle. The road becomes a maelstrom of careering animals, small boys yelling and flailing out with bits of stick trying to control the wayward calves and hapless customers waiting for the mêlée to settle before they dare to leave the safety of their cars. I love this trip to the edge of time. Mountain dwelling Kazakhs used to a transitory nomadic lifestyle, never ones for neat fences or spotless paddocks, safeguard their herds in tumbledown quarters of dusty land fenced around with old doors, pieces of beaten tin and old car panels covered with pieces of old clothing and roped off with random lengths of knotted string. Not for them mechanization or the huge, modern farms with efficient milking systems and the camel hair-gathering methods of their Arabian cousins. Our camel herding Kazakhs are contented to live as they have for centuries, eeking out a subsistence living at the edge of a booming city which has yet to touch them. A perfect way to spend an afternoon. Ruth Ingram has written about fashion, time zones, fast food, and skiing for EthnoTraveler. Her writing has also appeared in the Guardian.